Please don’t Honor Code me for that sentence. But what does it even mean for you to Honor Code me? What would happen if you did? And wait, what are you Honor Coding me for again? Now we’re lost in a bunch of King’s lingo, a Code (pardon the pun) for talking around the root of the matter. 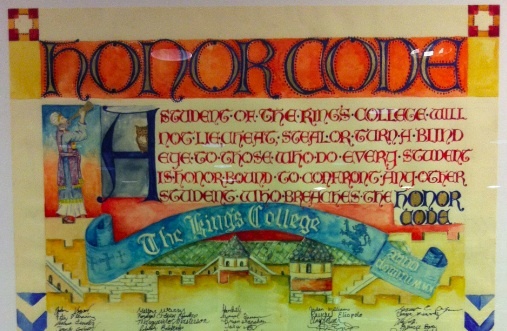 The Honor Code holds The King's College to a standard of accountability to each other and to God. Signing the Honor Code is a rite of passage for every student, an act in which we promise to not lie, cheat, steal or turn a blind eye to those who do. However, the Honor Code should not be the center of the school. While it helps our community, it should not be not our fabric or pulse. Aren't we The King’s College? Then our hearts should revolve around the King and His Gospel. Honor is a result, not the crux, of the Gospel. The Gospel is about us as sinners learning to forgive others because God forgave us, about a redeemed people trying to look more like our Redeemer. When we mess up, the concern is not that we violate the Honor Code but that we violate God’s holiness, failing to walk in a manner worthy of the calling to which we are called (I Thess. 2:12). This should be our focus when we discuss the Honor Code. For Christians, the Gospel leads to conviction and repentance, prompting the question “Why do I not act like Christ?” For non-Christians, the Gospel asks them to wrestle with the reality of their sin, the offer of salvation and what they don’t believe about it. The Gospel moves the honor conversation from the action to the heart. Talking about the Gospel leaves no one innocent because the measure of honor is Jesus, reminding us that no one is righteous, not even one (Rom. 3:10). Those who glance at their neighbor’s quiz or use the emergency exit instead of swiping their Metro card are as guilty as those getting high on marijuana or sipping spiked apple cider before their 21st birthday. When we turn our discussion to the Gospel, everyone becomes guilty. The conversation changes to “You’re broken. I’m broken. We need healing, and I want Jesus to do that for us.” As Dr. Kreeft says, the “I” becomes a “We,” and when “We” acknowledge our brokenness, true Christian community forms. Honor follows from talking about Jesus’s work and how we want to replicate it. If we talked more about the Gospel, we would need to talk less about honor, but we would live more honorably. We would obsess over the Person rather than the Code – the Person who washed away our sins and made us white as snow. So the next time the Honor Code comes up in conversation, instead of getting judgmental, angry or confused, remember who you are, the Person you want to become, and what He did for you. “Humility comes before honor” (Proverbs 15:33b). Catherine can be reached at catherine.ratcliffe@tkc.edu.